(Lanka e News -17.July.2018, 11.30PM) Those who are given to childish pleasure and wallowing on others’ sufferings posted a news report that speaker Karu Jayasuriya is sick and has been hospitalized. 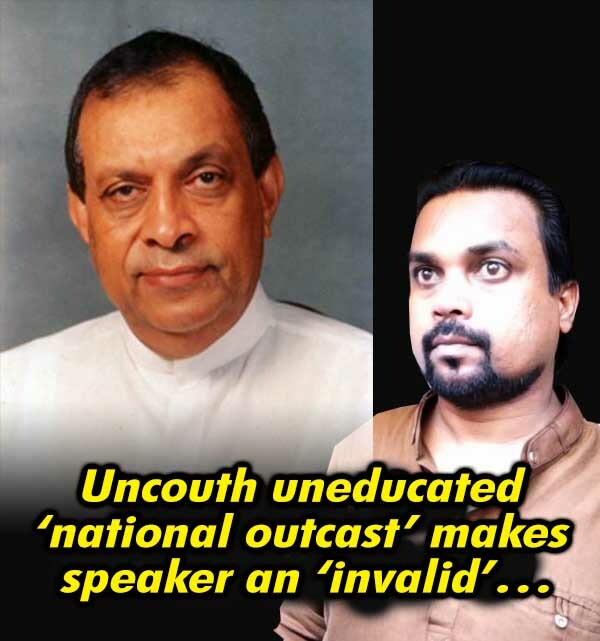 This news report is an absolute lie and it is the website “Lanka anjanam eliya’ of Wimal Weerawansa who addressed the speaker most insolently in parliament and is best known as the uneducated ‘ national outcast’, which has stooped to this level to post this most despicable lie. This lie has been concocted based on speaker’s medical checkup day before yesterday . This mendacious and malicious report is a clear indication of the evil wishful thinking of corrupt political scoundrels and to what lowliest levels such uneducated uncouth outcasts can descend to in their eagerness to fatten even on death and despair of their own colleagues. In fact the speaker who is as fit as a fiddle attended a national function yesterday as the chief guest. On the day the speaker was undergoing the medical check up which lasted 6 hours , the speaker had to go on answering calls unendingly , which in truth became a headache for the doctors .